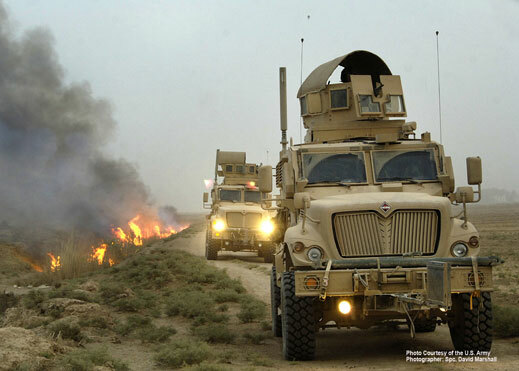 The International MaxxPro MRAP Family of vehicles has dominated the USMC MRAP program. Manufactured by the US Firm Navistar Defence, a division of Navistar Inc, it works closely with the established Israeli Firm Plasan Sasa Ltd who supply the armoured bodies, giving the vehicles their much respected armoured protection. In addition, by 2008, Navistar has shipped more than 130,000 parts pieces, components and other field support services to keep the MaxxPro MRAP vehicles mission-ready. Parts and service contracts thus far total nearly $300 million. The vehicles have been operated by US Armed Forces and Polish Armed Forces in place of HMMWV’s in the Afghanistan War. The US Armed Forces also operated them in the later years of the Iraq War in place of HMMWV’s. The International® MaxxPro, Mine-Resistant Ambush Protected (MRAP) vehicle incorporates the latest design in armoring technology and has been extensively tested by the military. The V-Shaped hull design is a proven technology used in theater today and coupled with other survivability factors; our vehicle is built with crew protection in mind. The MaxxPro AKA MaxxPro Base, was the first of this family to be tested by the USMC in 2007. Being a Category 1 class MRAP, 1200 were ordered in the same year at a cost of $623,000,000 USD’s. The MaxxPro Plus utilizes the best of the company’s original MaxxPro MRAP vehicle and incorporates enhancements to performance and survivability, including increased payload and additional engine power. Many commonalities exist across the MaxxPro platform to maximize troop interface, training and maintenance. First produced in 2008, MaxxPro Plus is part of the 5,214 MaxxPro MRAP vehicles (as of 2008) delivered to the US Armed Forces totalling nearly $3 billion USD in value. The MaxxPro Dash maintains the survivability system used on all MaxxPro MRAP variants while also allowing for greater mobility in a smaller, lighter weight vehicle optimized for Afghanistan operations. A smaller turning radius and higher torque to weight ratio are among the improvements to mobility. MaxxPro Dash is also capable of accommodating additional up-armoring. Supportability and maintainability are maximized with a high-degree of commonality of parts among all MaxxPro variants. In 2008 the USMC placed a $752,000,000 USD order for 800+ MaxxPro-Dash. The MaxxPro Ambulance vehicle utilizes all the features of the MaxxPro Plus. The interior of the vehicle is configured to accommodate wounded soldiers rather than carry troops and has the area to carry all the associated medical equipment necessary. International MaxxPro Utility Variants are designed to meet the ever-changing needs of troops in the theater of war. These vehicles provide the same level of protection and security as the MaxxPro Plus and Dash vehicles already deployed, and also offer new features that allow for increased mission capabilities. The Navistar recovery MRAP utility variants are the MaxxPro Wrecker, the MaxxPro Cargo, and the MaxxPro Tractor. All three utility vehicles are built on the company’s flexible International® WorkStar® platform with a MaxxPro Dash cab. 250 MaxxPro Wrecker’s have been ordered by the US Armed Forces.